We have stayed at numerous condos in this complex and this is our favorite unit now. The ocean view is the best. The accommodations were wonderful. The decor was very relaxing. The unit was well stocked with cooking utensils, bathroom needs, etc. I would recommend this unit for sure. But be aware you should take your own spices, herbs, oil, etc; and while there were a couple "hotel" coffee packs, I would suggest taking your own coffee in order to make enough good coffee for your visit. The condo is located on the top floor and has a beautiful view of the ocean. Sunrise and sunset were gorgeous. The condo itself was very comfortable and nicely decorated, we felt very much at home. The kitchen had everything you would need to cook a gourmet meal if you were so inclined. Check in and check out are simple and easy. Would definitely stay again. I loved staying in this unit! Very well equipped in the kitchen for preparing meals. Very cozy furnishings! The views are spectacular! The access to the beach during my stay was a bit of a walk due to dune preservation/restoration which was a bit inconvenient but totally understandable. Total relaxation. Thanks for staying and we appreciate your understanding regarding the beach access from this side of the property due to the dune restoration. We've stayed at several VBTS properties and have loved them all, but this one has to be right at the top of this list. It has a great room feel, so there is lots of room for everyone. There are extras in the kitchen so you can do all of your own cooking if you wish. The unit was very clean and the owners had amenities that made it feel like you were at home. We could have stayed here for weeks. Suberb views and great comfort. Two thumbs up. Be back next year. Another wonderful stay. On an impulse we decided to head down for the weekend. The only problem was that the weekend ended and we had to go back to work. This was my 3rd time staying here, and even with some crazy weather, it was fun and relaxing. With the heavy clouds and bits of rain, we experienced some beautiful rainbows. Just a lovely time in this condo, has everything anyone could need. We're thrilled to hear this stay was a wonderful as your previous visits. There is a saying here in Westport; "if you don't like the weather, just wait 15 minutes!" Thanks for visiting and see you next time. Comfortable, well appointed and maintained condo with a breath taking view and a short walk to the waves. Easy and professional rental process. Perfect family getaway! 3rd time staying here. Lovely view and decor. Feel so relaxed while there. Definitely will return. Wonderful experience as always. It's always comfortable, like coming home. Well, if home was on the ocean with a great view. I only wish I could of stayed longer this trip. This our 5th stay at #134 and it never fails to impress. Perfectly decorated, comfortable, clean, and the most amazing view! This condo has it all....view, clean, nice beds, good sheets, best equiped kitchen and a deck,too! It is nicely decorated and the fireplace was a very nice treat. Only bad part is no elevator to the 3rd floor. We will come back. 134 is a welcome home to an exquisite beach front paradise. All the amenities you need and then some. My 2 grandchildren and I experienced a vacation there we will carry in our hearts forever. 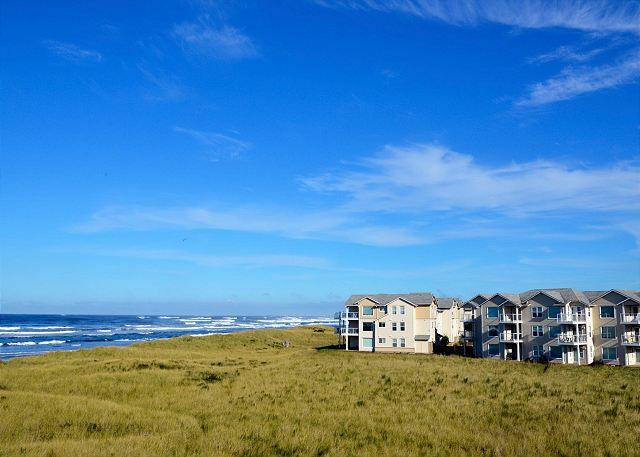 Thank you Vacations By the Sea for the outstanding job you do providing luxury vacation homes! We thoroughly enjoyed our stay.! The room was beautiful and well equipped. The weather was great and the views stunning.! The only issues were that the light fixture over the dining table was out..the dishwasher had a leak and we couldn't use it..and the beds we're really hard. It's sounds like a long list of negatives but to us they were minor problems..aside from the beds. Again we really had a great time.! Thanks.! Thanks for staying and you'll be happy to know the dishwasher was quickly replaced after your visit so that is no longer an issue. In regards to the lights, some of them are on a dimmer in this condo so the slider must be turned up or they appear off. Hope to see you all again. This was our second stay in Unit 134. The third floor gives a great view. It is a short walk to the beach, but is also nice to sit and watch the ocean from the living room. You even have a great view while cooking. The furniture is very comfortable and the decor is very nice. I even got a view ideas for redecorating our home in Maine. The kitchen was very well equipped. I wouldn't change a thing. 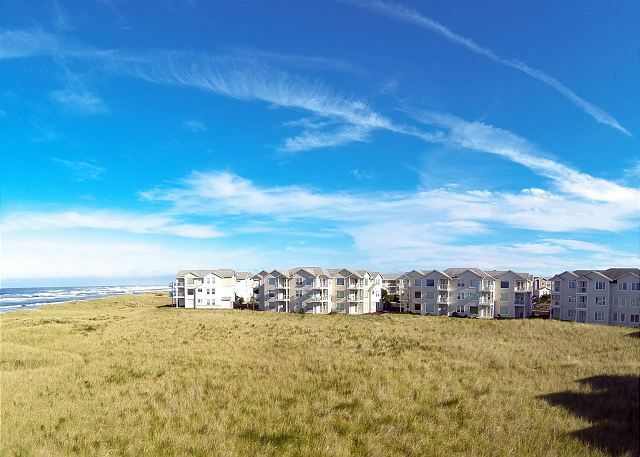 Don't miss walking to town on the paved trail along the dunes. We hope to be back to Vacations by the Sea again soon. We rented the condo for two nights, and although we were without power for 14 hours and no restaurants were open, we managed to really enjoy our stay. The condo is sited perfectly, and decorated in the beach theme that fits the environment. It seemed to have everything we needed, but we didn't have to verify that since we couldn't cook or really use much of the kitchen during the storm. A gentleman from the agency came by before dark to check on us and gave us flashlights that helped immensely and we played games by candle light. Would love to stay again, minus a storm. Just bad timing on our part. Thanks for staying and your understanding about the freak power outage. We haven't had any extended outages since 2007 so the force of the storm took us all by surprise. We love guests like you who can make the best of the situation and understand the true meaning of a beach getaway. Hope to see you again soon. Outstanding - we really appreciated the high spec of the condo. We have already re-booked this particular unit. Great condo. Modern furnishings were nice. We've now stayed at Vacations by the Sea four times, always very happy with the accommodations. But, vacation home 134 was exceptionally enjoyable. Tastefully decorated, well appointed, comfortable seating, dining, and viewing. Generously supplied book and entertainment libraries. Ample and complete upscale cooking and service pantries. Very memorable, the condo was very welcoming and felt like our home away from home. Great ocean views and a very short walk to the beach. This trip we brought our son and his girlfriend (thei first time there) and they asked when we were coming back. If you love sunsets, looking for seashells, surf fishing, riding go carts then you need to visit West Port Beach. Condon had a very good view of the ocean. We sleep well and enjoyed the view. 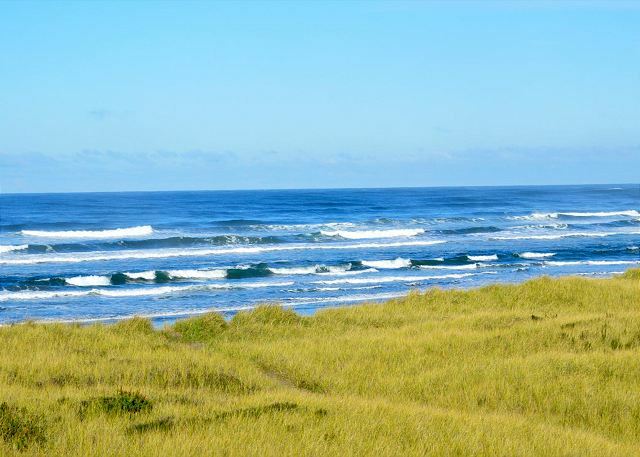 We have been staying at Vacation by the Sea since they open at another friends Condon closer to the beach for years and recommend this Condo for it's location and view of the ocean. This unit is so clean that it felt new. It is beautifully decorated and very homey. Wife and I have gone to Vacations by the Sea for 3 years. Always good place to get away, 134 is a great place to get away. we had a great expierence...amazing view. condo was clean and had everything we could want. What a perfect condo! Being on the top floor and on the corner, it was quiet and private. Plus, building 1 is a bit away from the other buildings, guaranteeing even more privacy. The decor is peaceful, comfortable, and immaculately clean. The owners have thought of everything you could possibly want. With two young kids (8 and 3 1/2), it was child-friendly. Only two weird glitches: 1. The TV system is pretty high tech. We never could figure out how to get Comcast to work (and I'm a tech savvy guy). Maybe a little sheet of directions would be helpful. Also, where in the work is the switch for the garbage disposal? It's plugged in, but we never found the switch to turn it on. Nevertheless, this was the perfect condo and we are already planning our next visit! Thanks for staying and glad you found the condo so well furnished and kid friendly. Please let us know of any difficulties you may encounter such as the TV and garbage disposal so we can help. The disposal is a "safety model" which uses a black plastic plunger piece to activate the switch inside. For the TV sometimes inputs can be switched from normal but we can resolve that pretty quickly if called. See you next time! We stayed for 5 dats and loved this unit. Amazing view, we'll furnished, and everything you need! Will stay here again.! The only problem had nothing to do with Vacations By a The Sea - there is no grocery store in Westport anymore!! Two friends and I went down to Westport to get away for some R and R for the weekend, and VBTS did not disappoint. The unit had everything we needed. The only thing we had to provide was, of course, our own food. Every detail was taken into consideration. We had everything we needed. This is a 3rd floor corner unit, facing the ocean. The views were outstanding. The beach trail closest to the unit worked well for us, but it might be a bit difficult to traverse for someone with mobility issues. All in all, an awesome stay. We definitely got our money's worth. I will absolutely recommend VBTS to friends and family. Felt relaxed and cozy from the moment we opened the door ...immediate ocean view, beautiful decor and so clean. Large spacious rooms. Every room was furnished and equipped with everything you would ever need...even a washer/dryer. Beds were very comfortable. My husband and I really enjoy the Westport /Grayland area and now have discovered a fantastic Home away from Home. We had so much fun! So happy you discovered this wonderful condo, we hope to see you again sometime soon! Our stay in #134 at Vacations by the Sea was a treat from start to finish! 5 stars! We enjoyed this visit in #134, which is on the third floor and close to the ocean. The layout is spacious and it's an end unit with many windows. The TV and DVD player made our 1960's TV show amazingly clear. The patio furniture is perfect, and I enjoyed reading outside on the chilly morning. I only have one little complaint, that the mattress in the 2nd bedroom is uncomfortable, and the bed in the master bedroom is way too high off the ground. But, really, overall we had a great stay.